***Jenny Colgan's next bestseller, The Endless Beach, is available for pre-order now*** Welcome back to Mount Polbearne! 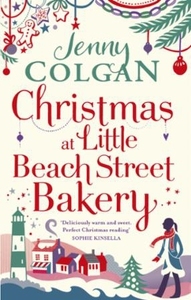 The new book from Top Ten bestseller Jenny Colgan is full of festive joy, warmth and the best hot chocolate you can imagine... It's Christmas in the Cornish coastal village of Mount Polbearne - a time for family, friends and feasting. Polly Waterford loves running the Little Beach Street Bakery. She's at her happiest when she's creating delicious treats and the festive season always inspires her to bake and knead something extra special for the village residents. In fact, the only thing she loves more than her bakery is curling up with her gorgeous boyfriend, Huckle. She's determined that this Christmas is going to be their best one yet, but life doesn't always work out as planned... When Polly's best friend Kerensa turns up with a secret that threatens the life Polly and Huckle have built together, the future begins to look uncertain. And then a face from Polly's past reappears and things become even more complicated. Polly can usually find solace in baking but she has a feeling that's not going to be enough this time. Can she get things back on track so that everyone has a merry Christmas?